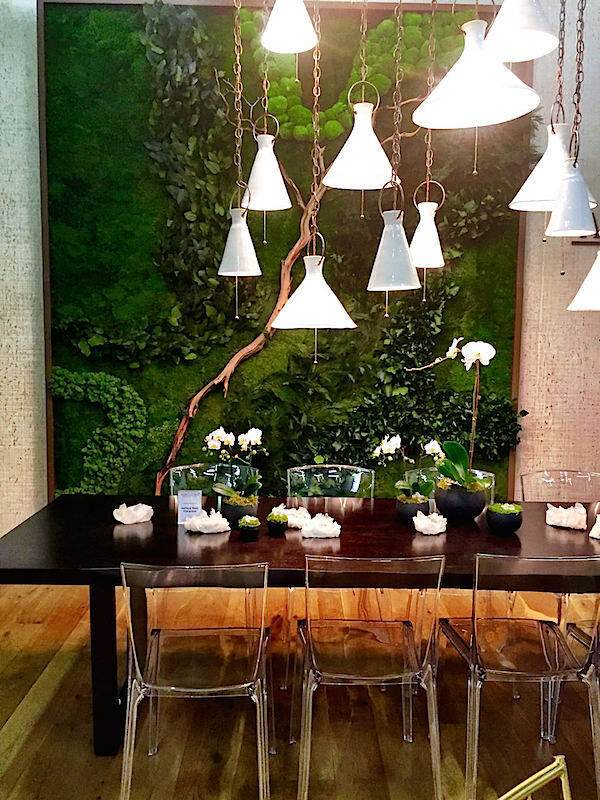 Nature is the ultimate backdrop for any vignette as we saw in our look at going green at the Architectural Digest Design Show and DIFFA Dining by Design last week. It was also perfectly utilized in Amy Lau‘s elegant area she designed as the Architectural Digest Design Studio with furnishings from Mitchell Gold + Bob Williams. A perfect place to rest weary feet and bleary eyes, it was like a breath of fresh air. Moving on into the show, it was clear reinforcement that craft is back. 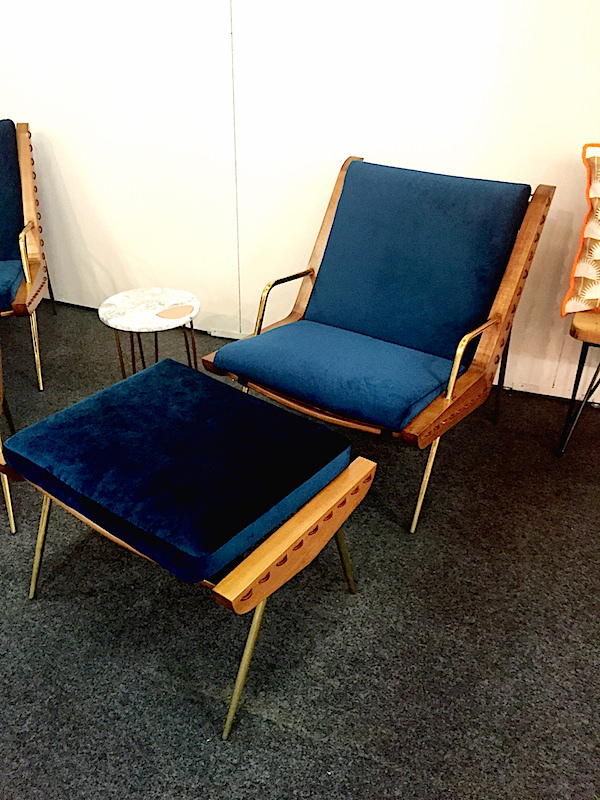 From fashion and food to design and decorating, the art and appeal of the human touch can be seen everywhere, including last week at the show. 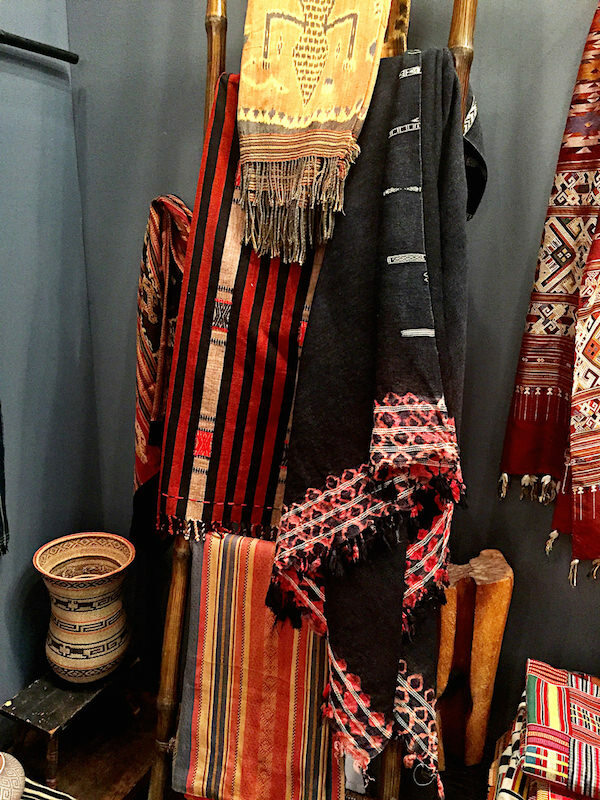 Artisans from Brooklyn to Bhutan were represented in a wide range of products, styles and materials. 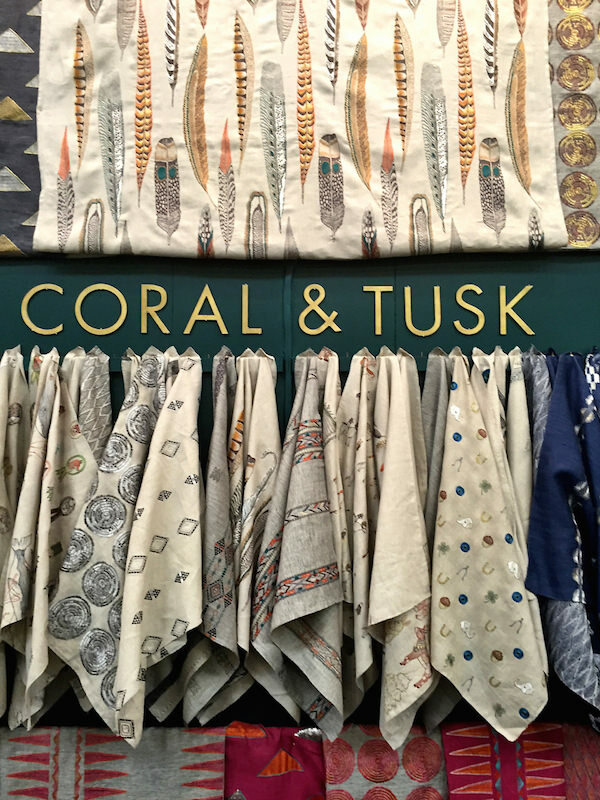 Everyone seemed happy to see cult favorite Coral & Tusk with their embroidered fabric by the yard, which they added to their collection of home decor and accessories last fall. While Stephanie Housley and team may be known primarily for their whimsical figurative work, the Wayfarer collection, below, is based on pattern and design influenced by the global textile traditions. 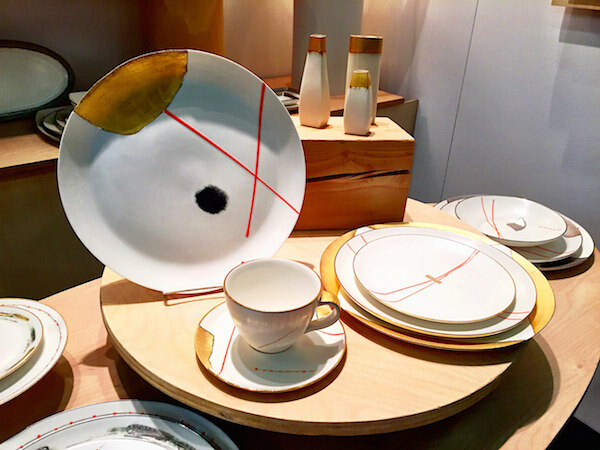 Daniel Levy‘s handmade porcelain combines a timeless craft with a modern minimalist aesthetic. 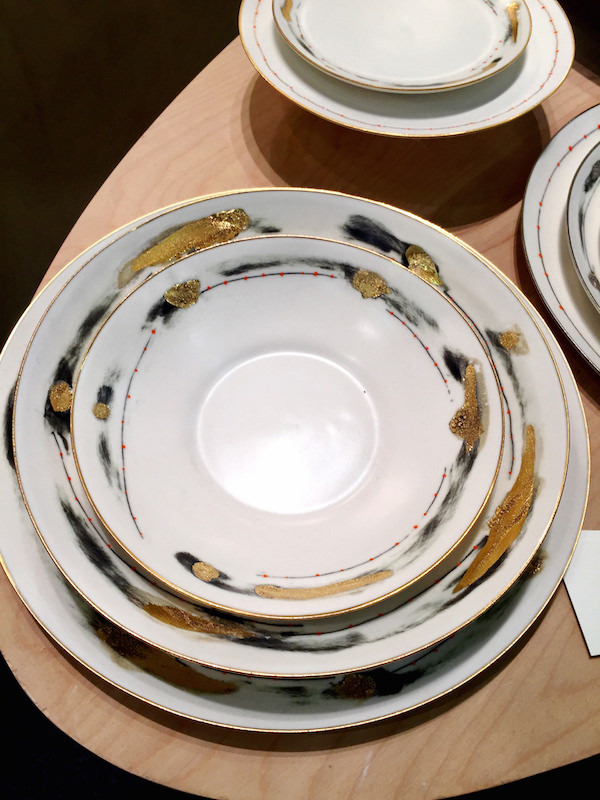 Embellished with multiple layers of 22k gold or platinum, his work is elegantfunctional art. I loved these new pieces with a rather rough luxe feel. 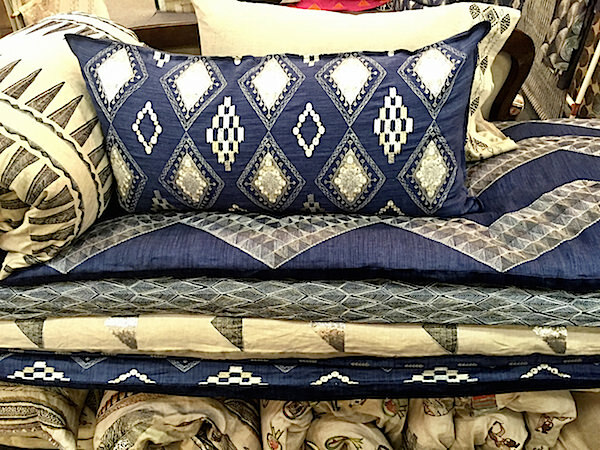 to textiles from around the world. 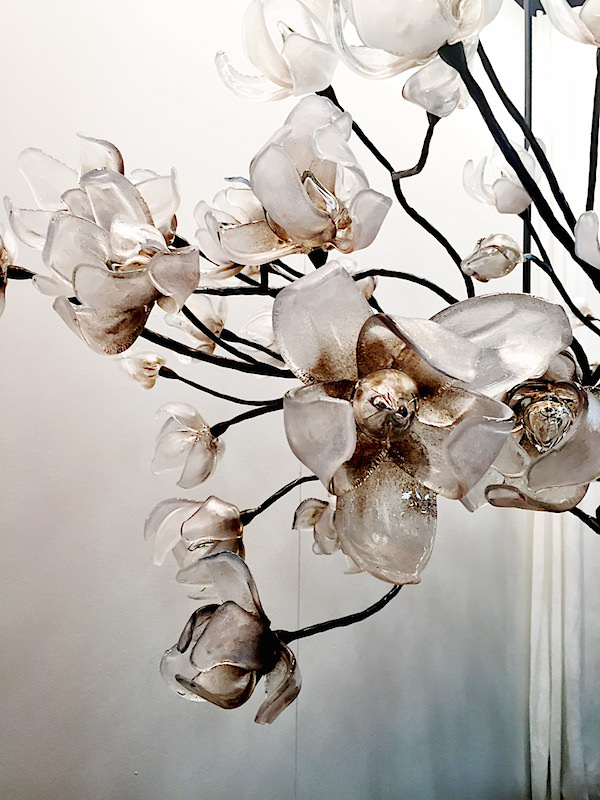 Glass artist Elizabeth Lyons‘ spectacular branching magnolia fixture was a showstopper. This large scale, handmade chandelier in the palest pastels was both delicate and grand. It is difficult to capture in photos the elegant luminosity of each flower. 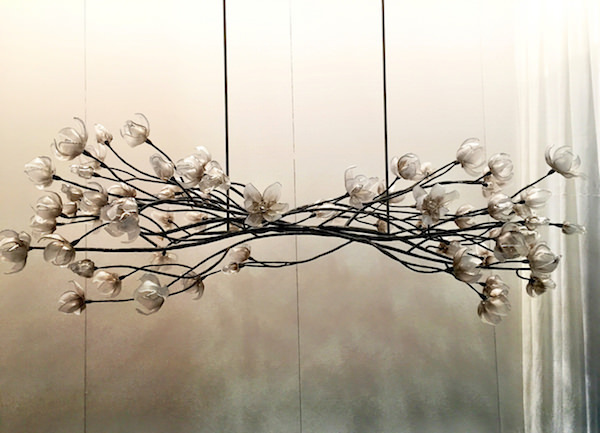 Another type of glass lighting was seen at Hubbardton Forge. Based in Vermont, it is one of the oldest and largest commercial forges still in operation. 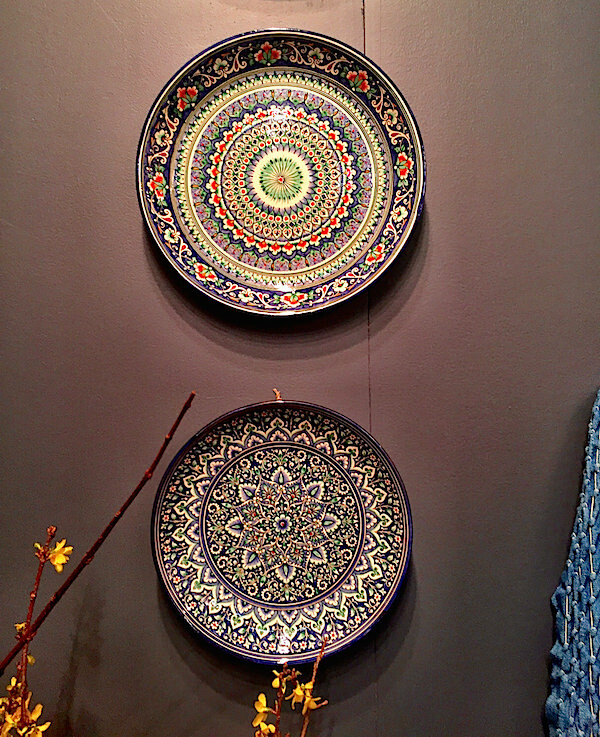 Here the art of the handmade combines traditional craft with modern technique and design. 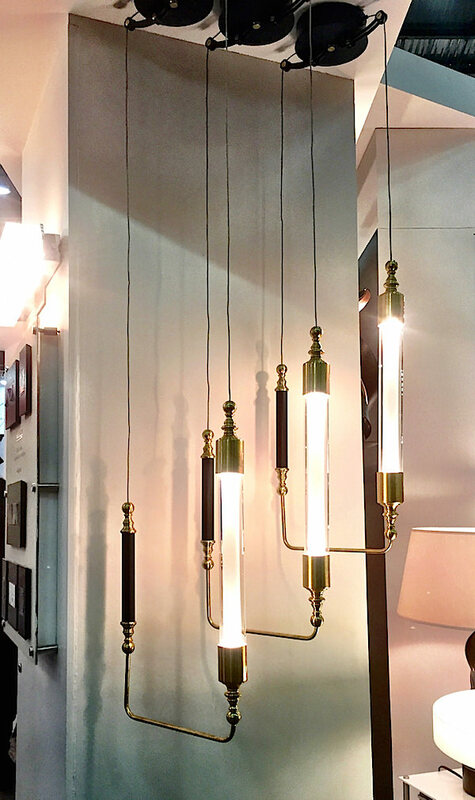 Their Otto lighting series is a unique design that defies category. 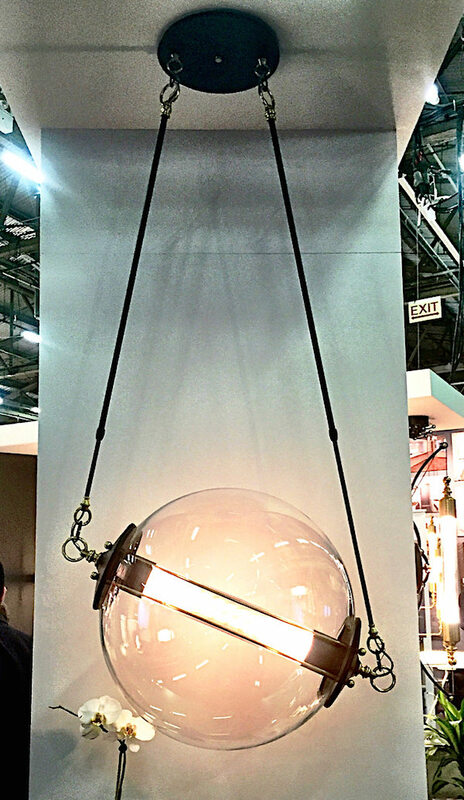 The vertical pendant above and glass sphere fixture below marry industrial chic with a luxurious detailing. 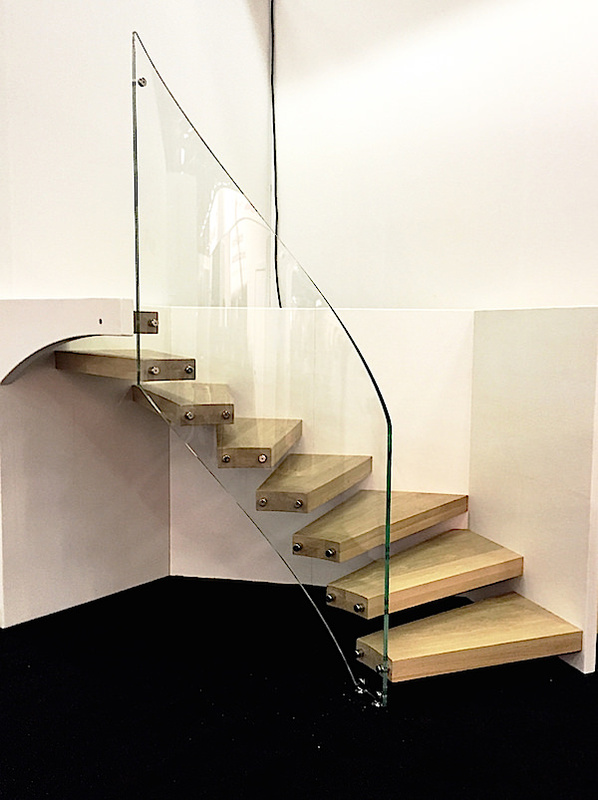 Marretti’s modern staircase uses glass to anchor its cantilever structure. The graceful spiral could create an interesting architectural dialogue within a contemporary or even rustic home – think barn or beach. Art in action was seen in several booths such as Flat Vernacular, below, where color coordination extended from wallpaper to fashion statement. 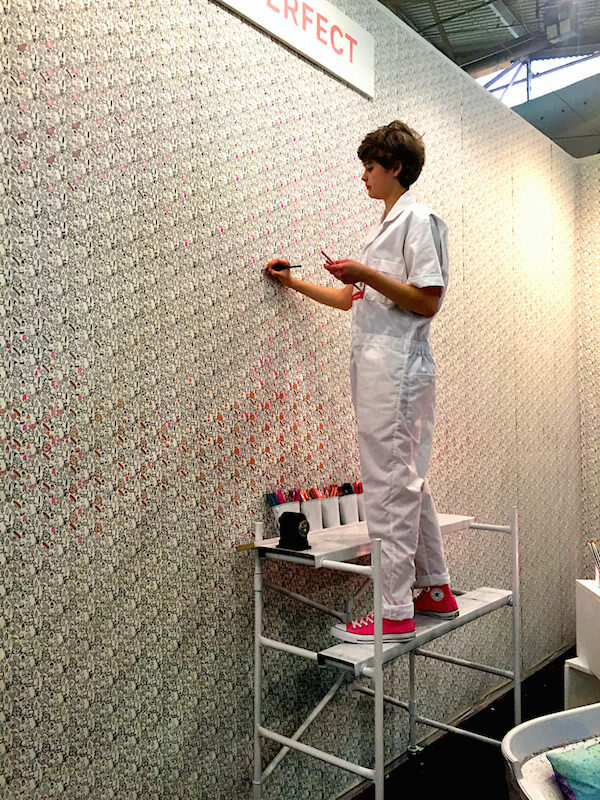 Their Pigeon Pizza Party wallpaper is the ultimate example of self expression – a pattern where the colors on the paper are up to you to fill in. 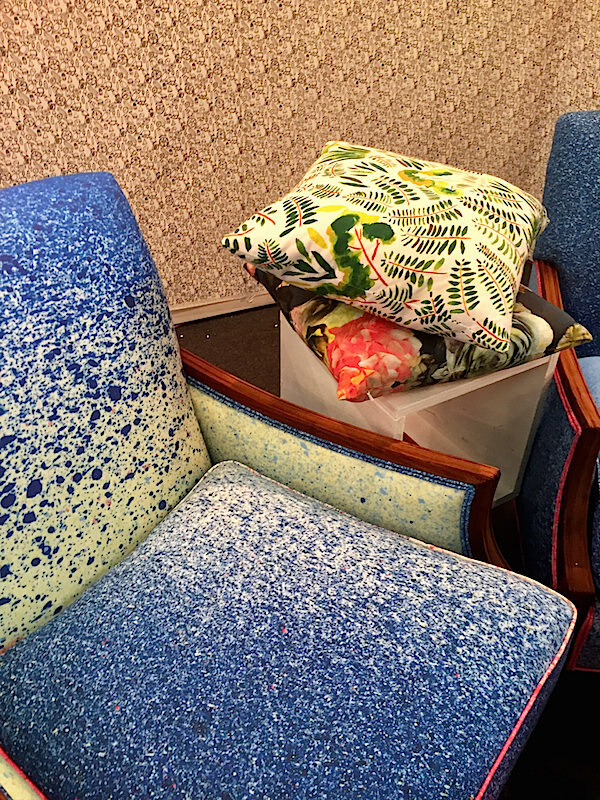 They have extended into textiles and showed their new patterns on one of a kind pieces refinished and upholstered by Chairloom. 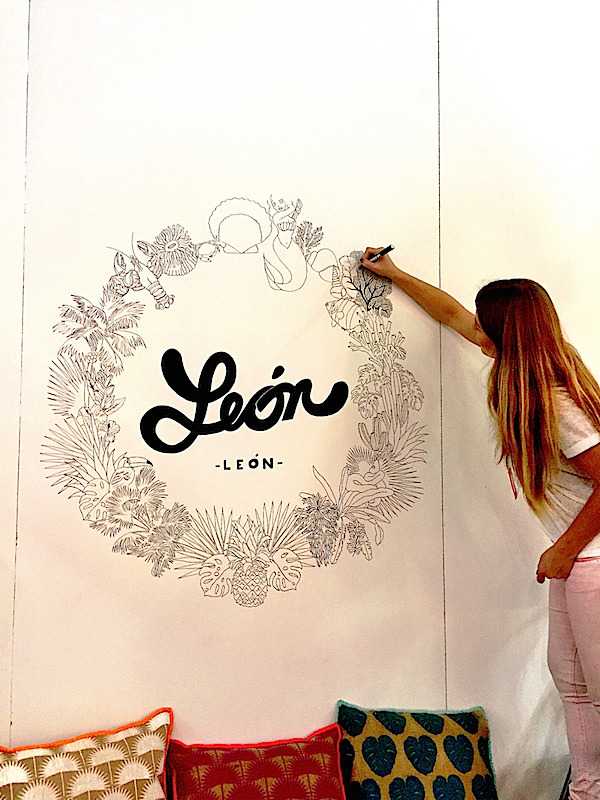 Mexico City based León León not only handcrafts furniture and lighting but can create artwork for walls and illustration and silkscreen printing. Inspired by the famous 1950’s Acapulco chair, they extended the design to lighting. 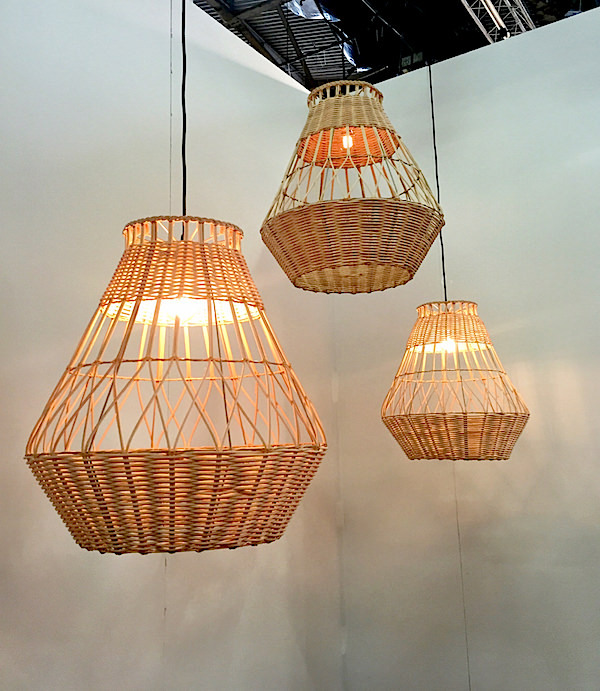 While many of their fixtures are steel, I loved these beachy wicker versions. A departure from their usual designs showed Leon Leon’s custom capabilities – all handmade in their workshop. Stop back next time for a continuing look at the Architectural Digest Design Show. This entry posted in art, design, furniture, interior design. Entry Tags: AD Design Show, Architectural Digest Design Show, art, Design, Furniture, interior design Bookmark the permalink. Stacey I love it all, from the lighting, the fabrics and the artful porcelain! A fabulous array of finds! I’ve fallen in love with the glass magnolia fixture. 79 queries in 0.475 seconds.